Circular Swiss Shower is a cascading vertical spray shower equipped with shower heads/ water injectors. It creates a gentle or vigorous rain shower from shoulders to anklets from above. 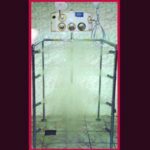 Swiss Shower treatments are very beneficial for overall health and well-being. This treatment provides relief from symptoms of tension, insomnia and stress. Swiss Shower treatment is a perfect complement to herbal body wraps, skin exfoliation and massage therapy. 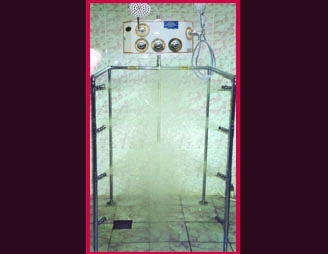 Circular Swiss Shower model Super consists of 5 chrome plated seamlessly connected vertical manifolds. Equipped with floor flanges (7pcs) and special connecting fittings (5pcs). Circular Swiss Shower model Super is equipped with 14 shower heads/ water injectors, Individual Control Panel UCP-SWSH and Universal Control Panel CR-530. To better fit your budget Circular Swiss Shower Super can be supplied with or without Universal Control Panel (see Specifications). Circular Swiss Shower model Standard class Economy is equipped with 12 shower heads / water injectors and Universal Control Panel CR-530. * Total shower heads / water injectors: 12 pcs (special design RM). Each shower head / water injector is equipped with flow control and swivel action to any position. Easy to clean up, special design eliminates mineral build-up. * CR-530 Universal Control Panel. Equipped with pressure / temperature gauge, main shut-off valve, etc. Chrome plated handles and fittings.